Yes. That's right. Sit down and enjoy a cup of coffee with us, while we tell you more about its history and varieties. But first - join us in a thankful thought, sent to the users of alt.culture.austrian, especially to Christian Pree and Peter Sint, because they supplied a lot of facts and ideas. We know that the use of coffee originated in Africa. From there it was brought to Arabia, where it was known at about 500 AD. When the Turks occupied most of eastern Europe under the Othman Empire, they made the use of coffee known in those areas. Still, there was a clear line of distinction between oriental and occidental cultures, and the use of coffee was one item. Until 1683. At that time the Turks had come to Vienna and besieged the city. They almost succeeded in their sinister quest, but finally an army came along from Poland and fought the invadors off. Now, legend tells us that the Turks fled so hastily, that they forgot to take their coffee with them. The people from Vienna didn't recognize it, thinking it was dung of the camels - animals equally unknown to them. Only a certain Kolschitzky is said to have known, what coffeebeans were used for, so he collected all of them and opened the first café in Vienna. The truth is slightly different. Whereas there was a man called Kolschitzky, who was an Austrian scout of Polish origin, during the war against the Turks, and even if he also was allowed to open a café in "Domgasse" in Vienna in 1686, he was not the first one. The first Viennese café was opened a year before by an Armenian named Johannes Diodato (Owanes Astouatzatur). Being born in Constantinopel he supposedly knew coffee and how to use it. But Kolschitzky is said to have invented the filtering of the coffee and to mix it with milk. 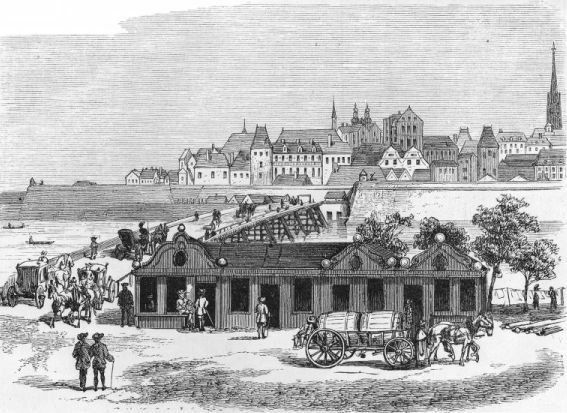 An engraving by Johann Adam Deisenbach in 1750 shows Kolschitzky's café. His heirs had agreed on moving the café to the Donaukanal at the Salztorbridge. However, there is no doubt that the Austrians came to know coffee through the Turks - and when the cultural border well was crossed, coffee made its triumph procession throughout western Europe as well. In the next century the Dutch used their colonies to grow coffee there, thus getting enough supply to the Old World. Today there are a large number of coffebeans, all of them tasting slightly different. There are numerous ways to treat the beans, before you sip the final product. Roasting is only one process (the lighter roasted, the "grainier", more acid, the taste of your coffee will be), you can grind it more or less, and finally you can boil it, brew it or make an Espresso-type of coffee. It is not within the realms of this page to explain the varieties, but do take a look at the links for more information. The same goes for recipes, of which there are a couple of hundreds on the Net. But here we want to give you an impression of what kind of coffee you can get in a Viennese "Kaffehaus". "Turkish coffee": Using a copper-pot, you pour the wellground coffee, sugar and water into it, stir it while boiling and serve the blend in a (small) cup. You have to wait a minute, until the coffeepowder has sunk, it will then remain at the bottom of the cup. This method is still used in southeastern Europe. Boiling coffee is also frequently used today in northern Sweden, not at least by the original people of the North, the Laps - or Sami as they prefer to be called. This is mainly because it is the easiest way to make coffee over an open fire. Boiling the coffee was the only alternative until the coffeefilter was invented, by a German woman. Her name was Melitta, and the Melitta-filter is still a classic trade mark. Since then we have the possibility to brew coffee as well. Finally Espresso-machines came into use, and today almost all coffee you order in cafés is of Espresso-type. Now, what kind of coffee can you order, and what do you get? Mokka: plain black coffee. The name is interesting though, because it is the name of port city in Yemen, that was the hub of the coffee trade. Maria Theresia: black coffee with orange liqueur (and whipped cream). Named after the Austrian "Empress" (1740-1780). Einspänner: served in a (high) glass. Black coffee with whipped cream. Brauner: coffee with some milk in it. Kapuziner: coffee with milk and whipped cream. Melange: (French pronunciation) half coffee, half milk. Kaisermelange: Melange with a yolk and honey. Franziskaner: Melange with whipped cream and choclate flakes. 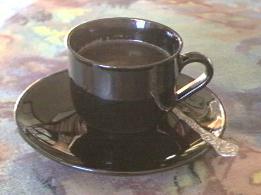 Verlängerter: black coffee diluted with water. Fiaker: Verlängerter with rum and whipped cream. Before you leave, please do have a stroll through the rest of our Netshop.